Original Antique Maps and Prints. 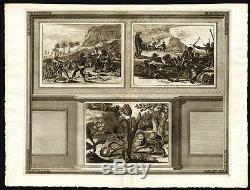 Rare Antique Print-SOUTH AFRICA-ETHIOPIA-LION-TULIP-KHOIKHOI-Van der Aa-1725. Description: This plate originates from the very scarse:'La galerie agreable du monde... Van der Aa, Leyden, c. This famous work was published in 66 parts and is the biggest print / map book ever published. Van der Aa incorporated plates by other publishers such as Blaeu, Visscher, de Wit, meurs, Halma, Mortier, Allard in this work and often added broad decorative borders. Probably the costliest and complete universal geographic work ever produced. , by Olfert Dapper (1639 - 1689). The Galerie Agreable contains plates and maps by the best Dutch engravers: Luiken, Goeree, Mulder, Stoopendaal, Aldert Meijer, Romeyn de Hooghe, ao. Subject: Plate 58: Print with 3 engravings :'Oeconomie des Hottentots ou Caffers - Cruaute des Jages dans la Basse Ethiopie a leurs Prisonniers - Fritillaria Promontorii Bonae Spei, Tulipa Promontorii Bonae Spei, Leo Africus, Leopardus Africus. 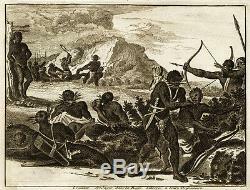 Household of the Hottentots / Khoikhoi - Cruelty of the Ethiopians towards their prisoners - Fritillaria / Stapelia variegata, Tulip, Lion, Leopard. Extremely rare in this edition. Condition: Size (in cm): The overall size is ca. 49 x 37.5 cm. The image size is ca. Size (in inch): The overall size is ca. 19.3 x 14.8 inch. 16.1 x 13.4 inch. Medium: Copperplate engraving on a verge type hand laid paper with watermark. ThePrintsCollector Peter Cornelissen, Margo van Latum - van Dongen, Frank van Latum Zeeland - The Netherlands. It is our privilege to have you as a customer. 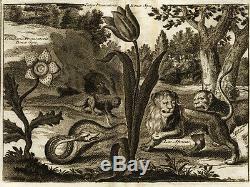 The item "Rare Antique Print-SOUTH AFRICA-ETHIOPIA-LION-TULIP-KHOIKHOI-Van der Aa-1725" is in sale since Thursday, November 12, 2015. This item is in the category "Art\Art Prints". The seller is "theprintscollectoruk" and is located in Zeeland. This item can be shipped worldwide.